Coming to the Full Moon Party with a preconceived view of what he was going to write, was this China editor jaded by too much time spent in Asia? He certainly didn't sound like the young, fresh '20-somethings' travelling to Asia for the first time, and ready to experience the party of their lives. And that's the point: the Full Moon Party is a Rite of Passage for hundreds of thousands of virgin travellers to Asia every year. 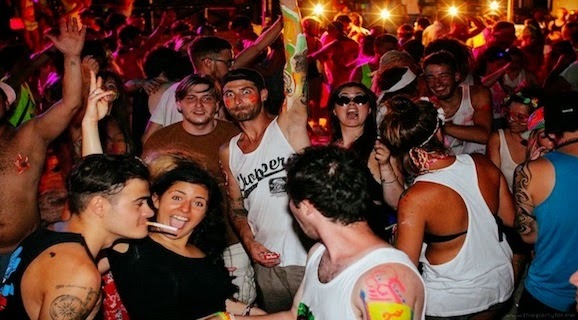 If they haven't experienced a Full Moon Party on Koh Phangan, they haven't lived. On an eye-opening tour to South East Asia, this party comes top of their 'bucket list'. So isn't it Time we dispelled the myth and put the facts into perspective? Reading behind the lines of Time Magazine's recent 'Trashy Disgrace' article, wasn't that more a reflection on our degenerative Western generation, whose idea of having fun and the time of their life is an alcohol fuelled binge? So, you see, it was Time itself who dispelled the Koh Phangan myth in the first place, and now, today, wishes to cast its iron opinion on our beloved island, again. How so? 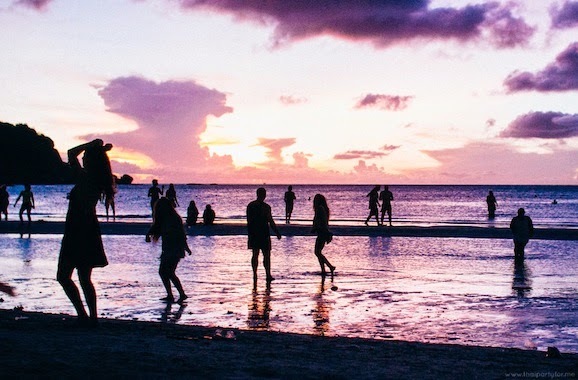 30,000 people regularly came flocking to the Full Moon Party like never before after that 2000 article, and the rest is history. Suddenly the native Koh Phangan Thais, who didn't even have electricity (except for generators before the year 2000) were catapulted into the modern age. Remember that only 30 yrs before today they were harvesting coconuts and fishing from the Koh Phangan coral reefs as livelihoods. Considering they had no idea how to cope with the plastic fantastic age which was about to descend upon them, the Koh Phangan Thais, you would have to say, have been doing a pretty good job of keeping their environment as pristine as they possibly can. They haven't had the 200 yrs since the industrial revolution - that we in the West have had - to adapt and cope with the change! For a few days of the month, when 30,000 revellers descend on Haad Rin, it is a wild party chaos. But look at these scenes of Glastonbury in June 2014 and it was no different. Trash everywhere, disgarded by the non-conscious party goers who herald from a throw away Western society. It will be 6 weeks before Glastonbury will be restored to its natural beauty… But take a look at Haad Rin the next morning after the Full Moon Party, July 2014. The day after the biggest festival in Asia, it is crystal clean and once again one of the most breath-taking beaches in South East Asia. Is Haad Rin the trashy disgrace? 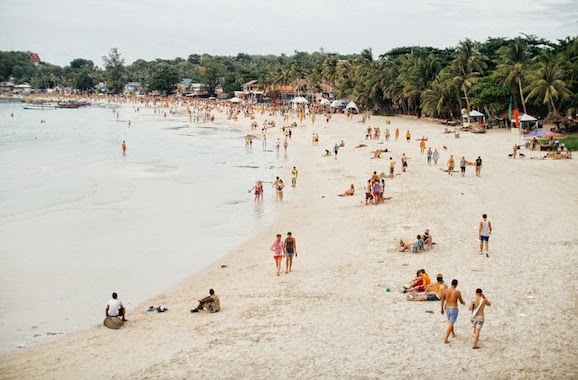 Head to Haad Rin at 10am the next morning, and you will find yourself on the most pristine beach and stunning bay in S E Asia, with absolutely no throwback to the wild party of the night before. Is it really us Koh Phangan long-termers who need to take our rose-coloured glasses off, I wonder? Haad Rin has received enough bad press. And all because it's a good story to tell - and sell. Just like that Asia commentator, who admits in his latest diatribe that most of his research - and his opinion of the Full Moon Party - were decided upon long before he even arrived on the island. It wasn't objective: he went out with the intention to Slate the Full Moon Party. It was, once again, sensational. But you can't take that into account without listening to the thousands of 20 yr old voices, having the time of their life at this party to end all parties, every single month of the year. Who better to ask than David Dancing Elephant, who has successfully run Haad Rin's No.1 party hostel for the last 5 years. In that time he has seen over 5000 revellers pass through his Dancing Elephant Hostel, all excited beyond belief to be experiencing the Full Moon Party for the first time. "Yes, totally, the Full Moon Party is really an incredible moment in their trip. They can prepare up to 11 months in advance, they book their hostel, they dream about it. When they arrive, or even before they arrive, they tell or write to me how VERY excited they feel about this week of parties." The Full Moon Party for most people is a one time event. 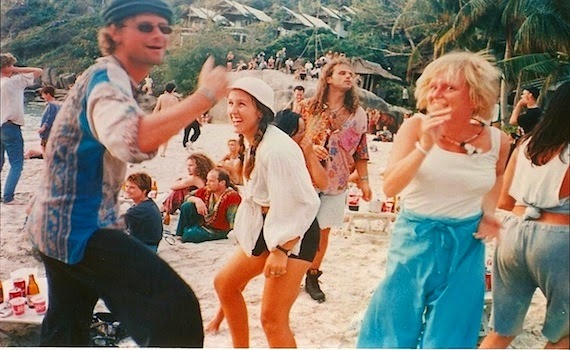 "It was the time of my life"
The Full Moon Party means the world to them. It means they have lived, and it is a rite of passage: they are a world traveller. They have experienced the most iconic party of their life. They'll still be wearing their Full Moon Party T-shirts and wristbands as they carry on the South East Asian road. They've earned their travelling stripes, and they are proud of them. They'll tell their Full Moon Party stories from Cambodia to Australia. When they get home, you can be sure their favourite memories will be their fleuro-painted photographs of themselves and their Koh Phangan tattoos. It's a sign they have lived, survived, and they are alive. 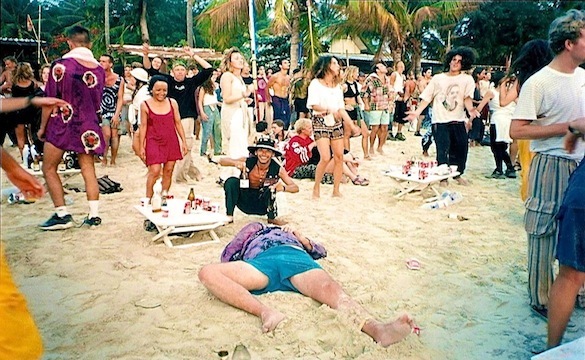 Long live the Full Moon Party & the Rite of Passage it signifies! that kicked until dawn a few times a week.